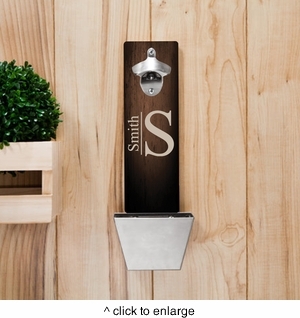 DETAILS: This monogrammed bottle opener/top catcher is the perfect addition to any home bar. Offering three different monograms to choose from, you'll find one just right for your needs. It even includes a personalized line of text up to 15 characters. The opener/catcher includes keyhole mounting holes on the back side and vent holes in the bottom. Comes with both the bottle opener and cap catcher, so no separate purchases are needed! Made of wood and brushed stainless metal. Hardware for mounting is included. Some assembly is required. PERSONALIZATION: 1 line up to 15 characters. Your choice of monogram design.